Theewaterskloof, (TWK) in the Western Cape has become the third municipality in South Africa to partner with the FMF to bring the economic power of home ownership to black tenants deprived of the dignity and rights under apartheid. Sponsored by the Two-a-Day Group and the Elgin Foundation, the partnership agreement signed at a ceremony on 23 October 2015, will facilitate the conversion of 60 council owned rental properties into freehold title and officially transfer ownership to the registered occupants. 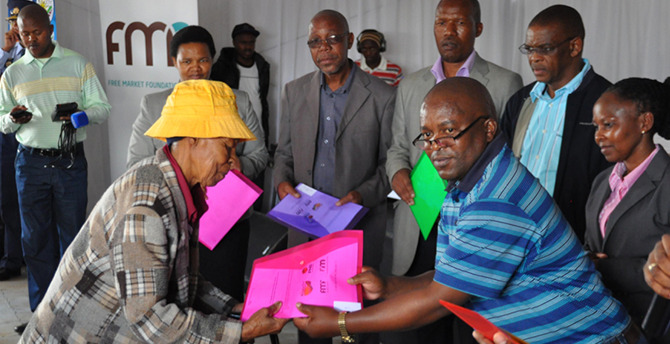 The Free Market Foundation (FMF) is the driving force behind the Khaya Lam land reform initiative, which aims to bring about a true end to land discrimination by assisting the transfer of title deeds to tenants currently occupying municipality owned land and houses under Apartheid era regulations at no cost to the beneficiaries. Stan Wallace, municipal manager of Theewaterskloof, said this was a groundbreaking intervention for the Theewaterskloof Municipal district. “It is imperative that the private sector, local government and communities seize opportunities like this to enhance private ownership of houses amongst vast numbers of people in the area”. He continued, “The private sector, development groups such as the Elgin Foundation and the FMF can and should be significant partners and stakeholders in such initiatives. The municipality applauds the involvement of Two-a-Day in the project and trusts that it will encourage others to do the same. The funds made available will make it possible for people to obtain ownership of houses they have lived in for many years. These houses will be registered in the names of the beneficiaries representing housing security and better lives for our people”. Dimitri Jacobs, HR Director, Two-a-Day said,” Two-a-Day Group (Pty) Ltd is honoured to be part of the FMF’s Khaya Lam Project in Theewaterskloof, which not only helps people own their own home but restores a sense of dignity in our community. Supporting the Khaya Lam project is an extension of our current community development initiatives, which we believe will add immense value to the lives of some of our employees but also in the broader community. Owning fixed property opens previously closed doors and our contribution will help people to become economically active. We sincerely hope that more businesses in the region will become involved in this project to assist in the conversion of more than 500 houses. Speaking for the Elgin Foundation, Derek Corder said, “We are excited to be involved in the title deeds project driven by the FMF and the TWK Municipality after being approached by the Two-a-Day Group to sponsor the first phase of this project in the Theewaterskloof area. We look forward to seeing this project reach fruition and being part of the process of restoring dignity and pride in our poorer communities”. The FMF’s executive director Leon Louw said, “Black land deprivation was probably the single worst element of apartheid. Ever since apartheid ended, little has changed in this regard. In South Africa today there are still between 7 million and 10 million black families living as tenants or without ownership rights in houses they have lived in for generations. There has been no systematic conversion of these “council owned” and “traditional community” properties to full unrestricted ownership”.